George Zimmerman to Sean Hannity: Trayvon Martin shooting was "a tragic situation"
(CBS News) George Zimmerman told Fox News' Sean Hannity on Wednesday that the Trayvon Martin shooting was "a tragic situation." "I hope it's the most difficult thing I'll ever go through in my life," said Zimmerman, who is charged with second-degree murder in the 17-year-old's death. Zimmerman told Hannity that he had not been home since Feb. 26, the night he shot Martin. "I wanted to go to Target and I headed out and that's the last time I've been home," he said. Hannity, who had been in contact with Zimmerman before he was arrested in April, taped the interview Wednesday in Seminole County, Fla. The Fox News host began the interview by asking Zimmerman why he became a community watchman. Zimmerman recalled an August 2011 neighborhood burglary that scared his wife. "I promised her I would do what I could to keep her safe," he said. Zimmerman told Hannity that he carried his gun - for which he had a permit - everywhere he went, except work, but that prior to the night he shot Martin he'd never heard of Florida's "Stand Your Ground" self-defense law. He also said he felt that his life was in danger and that the media attention to his case felt "surreal." Hannity spent the first segment of the interview focused on the night of the shooting. He asked if when Zimmerman saw Martin reach toward his waistband, "Did you think that was a gun?" "To make you think there's a gun..." offered Hannity. "Of some kind," said Hannity. Zimmerman, describing seeing Martin coming toward him, said: "His demeanor, his body language was confrontational." Hannity asked why Zimmerman said "yes" when the dispatch operator asked him if he was following Martin. "I mean that I was going in the same direction as him to keep an eye on him so I could tell the police where he was going. 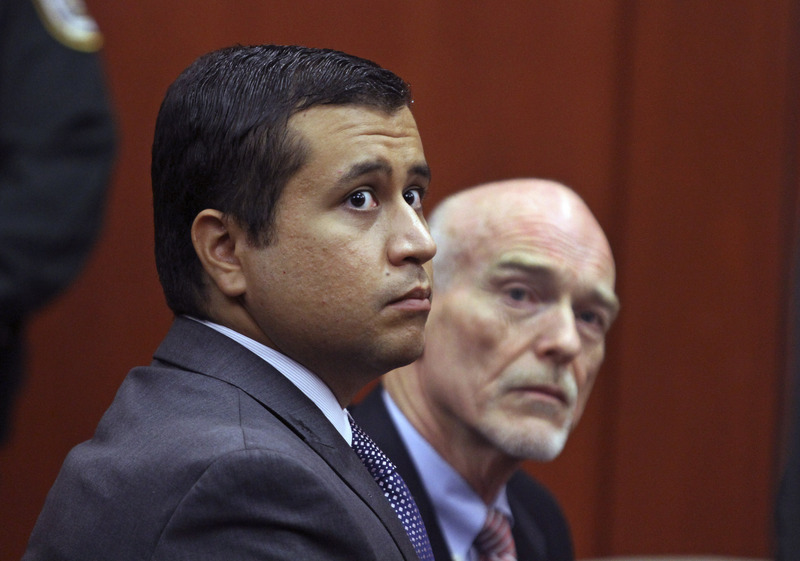 I didn't mean that I was actually pursuing him," Zimmerman explained. When asked about the confrontation that led to the shooting, Zimmerman said that Martin "asked me what my problem was." He said he was wearing a rain jacket that night and that he'd put his cell phone in that instead of his jeans, where he normally kept it. "I immediately went to grab my phone to call 911 instead of the non-emergency and when I reached into my pants pocket it wasn't there and I was shocked," Zimmerman said. "I looked up and he punched me and broke my nose." Zimmerman said he ended up on the ground and that Martin punched him more than a dozen times. Zimmerman's attorney, Mark O'Mara, sat next to him throughout the interview but only spoke briefly. O'Mara has recently filed a motion asking for the judge in the case, Judge Kenneth Lester, to step down. Zimmerman told Hannity that he is "confident in the system" that will determine whether he goes to prison or not for Martin's death. "I'm not a racist and I'm not a murderer," he said. Zimmerman said he prayed daily for the Martin family and was sorry for the death of their son. When first asked, he said he didn't regret either carrying a gun that night or getting out of the car, which the 911 dispatcher advised him not to do. He said that looking back, he wouldn't have done anything differently. "It was all God's plan," Zimmerman said. But at the end of the interview, he readdressed the issue, saying he hadn't clearly understood the question. "I do wish that there was something, anything that I could have done that wouldn't have put me in the position where I had to take his life," Zimmerman said. In response to Zimmerman's comments on Fox News that the incident was "God's plan," Tracy Martin, Trayvon's father, told CBS News: "We must worship a different God because there is no way that my God would have wanted George Zimmerman to kill my teenage son." Trayvon Martin's parents will be appearing on CBS This Morning on Thursday morning to discuss Zimmerman's Fox News interview. The show airs on your local CBS station at 7 a.m.